See the Disneyland Hours for December 2019 at Disneyland California. All through the month of December, Disneyland celebrates the holiday season with special decorations. The weeks with Christmas and New Years are popular vacation weeks, so Disneyland opens earlier and closes later to handle the holiday crowds. December means holiday time at Disneyland, or as some would say, Christmas at Disneyland. The decorations go up in mid November and stay past New Years. Many schools close for 2 weeks during the weeks of Christmas and New Years. This is a special time of year to visit Disneyland with your family. This year Christmas day is Wednessday December 25 2019 and New Years Eve is Tuesday December 31 2019. Is Disneyland open on Christmas Eve? 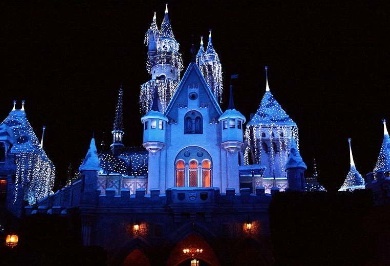 Is Disneyland open on Christmas Day? Is Disneyland open on New Years Eve? Is Disneyland open on New Years Day? Is Disneyland open on rainy days? Yes, although most days are sunny in Southern California. When it rains, the park stays open. You may want to bring a parka to wear if it is rainy, or you can buy one at the park. All through December Disneyland celebrates the holiday season with special decorations. The weeks with Christmas and New Years are popular vacation weeks, so Disneyland opens earlier and closes later to handle the holiday crowds. During the week between Christmas and New Years, both Disneyland California and Disney California Adventure parks will typically be open one hour early for Magic Morning and Extra Magic Hour if you had qualifying tickets. Based on prior years, it is possible for the crowd capacity to exceed the daily limit during these holiday weeks, so you can even be turned away unless you are holding a multi-day ticket or Premium Annual Passport. So it is important to arrive early, and I mean before 8 AM. What are the Disneyland Hours of Operation for December? See the Disneyland opening and closing times during December in the following table. The early morning admission hours are also shown. *If you have a ticket with early admission privilege, the early admission hours for Disneyland (DL) or California Adventure (CA) theme parks are one hour before regular park hours of operation. **Some Disney annual passes are blocked on certain days. especially during popular times like Christmas and New Years holiday weeks. All passes are good unless listed here as block out days. Disneyland passports with block out dates include Signature (S), Deluxe (DL) SoCal (SC) and SoCal Select (SCS) Disney California annual passes.